Like many others, I personally and strongly oppose SOPA (Stop Online Piracy Act), also known as House Bill 3261 and the Senate version PIPA (Protect Intellectual Property Act) or S. 968. Supporters believe the bills, if made law, would expand the ability of U.S. law enforcement and copyright holders to fight online trafficking in copyrighted intellectual property and counterfeit goods. Opponents, like myself, believe that they violate the First Amendment, is Internet censorship, will cripple the Internet, and threaten whistle-blowing and other free speech actions. 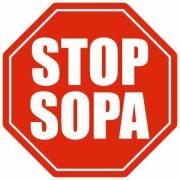 I absolutely agree that SOPA and PIPA are monuments to both the betrayal of American and global human liberties and technologically stupid. On top of that, your admonition that each of us should think for ourselves, make up our own minds is superbly to the point. Learn and think about this stuff, folks! It is vitally important if you care about liberty. It's okay to disagree with me. I like to argue. But what will happen if you argue with the government or a big corporation and consequently have your business, access to phone and Internet taken away?? Both of these need to get killed. If they do, there will be similar bills. I have the same concerns as you Steve.